This marks the very first time I've ever tried a beer by the insanely popular The Bruery out of California. I've seen their beers being posted all over social media and Reddit for years now, so it's great to finally get to try one of their beers! 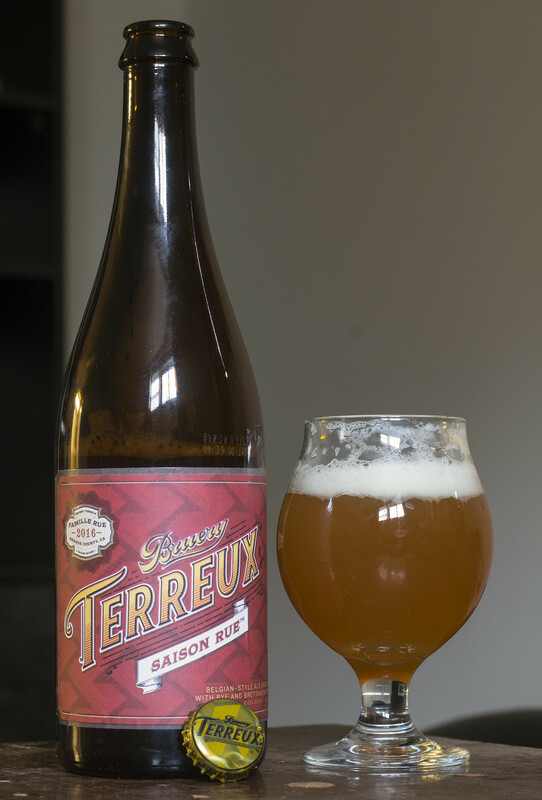 Bruery Terreux Saison Rue (Famille 2016) is actually a project by their Bruery Terreux spinoff brewery, which was born to solely create experimental wild and sour beers. Saison Rue is described as: "Saison Rue is an unfiltered, bottle conditioned, Belgian/French-style farmhouse ale. This is a beer of subtlety and complexity, with malted rye, spicy, fruity yeast notes, biscuit-like malt backbone and a slight citrus hop character. With age, this beer will dry out and will become more complex with rustic notes of leather and earth from the contribution of a wild yeast strain. Being a saison, Saison Rue is ambiguous unto itself as it is a different beer when fresh and when aged. Appearance: Pours a murky dark orange with a light amount of carbonation, kind of reminiscent of making homemade iced tea as a kid with that Good Host powder stuff (the best stuff!) The head is very hefty off-white and doesn't seem to want to go anywhere until I touch the foam.. then the head starts to fizzle a bit to leave behind a good amount of lacing and a good finger's worth of head on top. Aroma: The aroma of Brett yeast pops out right as soon as I open the bottle - it's a funky, barnyard aroma with a bit of woodiness, lemon, a hint of bubble gum, some floral and earthy hop notes, and also a light amount of and earthy bitterness from the rye malt. It's mildly sweet with a bit of a pear fruitiness in it and surprisingly not as sour and pungent as many wild yeast-based saisons I've had in the past several weeks. Fairly sweet, definitely barnyard funky, somewhat earthy. Taste: The combination of the Brett and rye malt are like a dream combination to me - the Brett has a moderate barnyard taste to it while the rye seems to compliment the barnyard funk by giving it a mild amount of an earthiness and a good caramel sweetness to it. I'm finding it's only slightly sour or tart with a lemon presence to it. Again, I'm getting notes of honey and bubble gum sweetness.. something I personally haven't seen in many wild yeast beers. There's an ever so light amount of pepper spice to it and a hint of pear. The mouthfeel is dry but pretty hefty and the aftertaste is a mild earthy bitterness that I'm thinking is coming from the rye malt. Overall Thoughts: Bruery Terreux's Saison Rue has everything I love about a Saison - it's dry, has a bit of a bubble gum flavour to it, a fair amount of breadiness, a good amount of carbonation and a good deal of sweetness.. these are all what made me fall in love with Saisons back in 2009. This combined with the use of rye malt and Brett definitely made this beer pop for the aroma and flavour profiles. I find that sometimes it seems like breweries are trying too hard to make Brett-based saisons to be all about the yeast, so it ends up that the Saison tastes more like a sour than anything else.. I do like sours but not so much when I just want a solid saison. The rye gave the beer a nice earthiness to it and a hint of spice that I just can't get enough of. This is absolutely delicious and I think this beats out the bottle of Hill Farmstead Florence that I just reviewed a few days ago. I think it's time to write a plea to MLCC to bring some Bruery products to Manitoba..